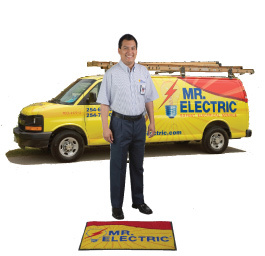 If you are looking for the best electrician in Portland, OR or Vancouver, WA, call Mr Electric today! We will send a clean, friendly, professional electrician in one of our Mr Electric vans that will arrive at your front door within a scheduled appointment time. Our Portland electricians are ready to take care of your electrical needs, no matter how big or small the project. From a single outlet installation to a complete house rewiring, we ensure all work is done safely, in a timely manner and complies with all the applicable electrical codes. Uniformed, background-checked and drug-free electricians. Congratulations to Mr Electric of Portland being pinned as one of Dwyer Group's Top Gun Admirals for 6 successive years (2008,2009,2010,2011, 2012, 2013). The Top Gun Award is presented to all Mr. Electric franchises who are in the top 10% of the Mr. Electric franchise network and is based on Quality of service, sales per capita, and overall sales. Need electrician in Portland OR? Fill in this form and we will contact you shortly! Our Portland electricians adhere to the highest standards of workmanship in the industry; our electricians use only the best contractor-grade materials. We are confident in the electrical work we do: we provide a 5-year warranty on all jobs. Our Portland electricians provide an exact, guaranteed upfront price before the job starts. Our electricians charge on a per-project basis, not hourly, so you know exactly what is it going to cost you: no surprises. We respect your time, so we send electricians, not estimators to your home. They have fully stocked vans and are ready to do the work right away in most cases. Our Portland electricians always strive to deliver peace of mind to you without charging extra. When our electricians finish a project, they offer a courtesy safety inspection check, completely free of charge to survey and discover possible dangerous electrical problems before they become safety hazards and result in an unplanned financial hardship. Our Portland electricians know that our electricians are people that will work in your home. We protect you by doing backgound checks on all of our Service Professionals. Mr. Electric Electricians in Portland is a licensed and insured commercial and residential electrical contractor delivering the highest quality of electrical service and repair to homes and businesses in the Portland Metro area.